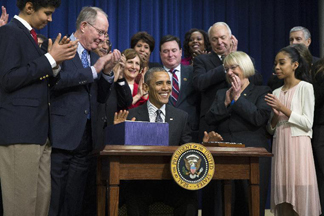 Calling it a “Christmas miracle,” President Barack Obama signed a sweeping overhaul of the No Child Left Behind education law on Thursday December 10, ushering in a new approach to accountability, teacher evaluations and the way the most poorly performing schools are pushed to improve. The overhaul ends more than a decade of what critics have derided as one-size-fits-all federal policies dictating accountability and improvement for the nation’s 100,000 or so public schools. But one key feature remains: Students will still take federally required statewide reading and math exams. Still, the new law encourages states to limit the time students spend on testing and diminishes the high stakes for underperforming schools. The long-awaited bill to replace the 2002 law easily passed the Senate on Wednesday and the House last week, in a rare example of the Republican-controlled Congress and Obama finding common ground on major legislation. Obama held it up as an “example of how bipartisanship should work,” noting that opposing sides had compromised to reach a deal. Rep. John Kline, R-Minn., who chairs the House’s education panel, said under the new approach, American classrooms will no longer be “micromanaged” by the Education Department in Wash­ington. “Instead, parents, teachers, and state and local education leaders will regain control of their schools,” said Kline, part of the bipartisan quartet that spearheaded the bill. The new law eliminates the federal mandate that teacher evaluations be tied to student performance on the statewide tests. Teachers’ unions hated that idea, saying the high stakes associated with the tests were creating a culture of over-testing and detracting from the learning environment. States and districts will still be able, but not required, to link scores or consider them as a factor in teacher performance reviews. Don’t start applauding yet, kids. The nation’s 50 million students in public schools will still have to take the federally mandated statewide reading and math exams in grades three to eight and once in high school — so parents, teachers and others can see how they are doing against a common measuring stick. But the law also encourages states to set caps on the amount of time students spend on testing. The college and career-ready curriculum guidelines were created by the states but became a flashpoint for those critical of Washington’s influence in schools. The administration offered grants through its Race to the Top program for states that adopted strong academic standards for students. The measure substantially limits the federal government’s role, barring the Education Department from telling states and local districts how to assess school and teacher performance.